We are enthusiastically occupied with giving a restrictive exhibit of Concealed Handle to our regarded customers. 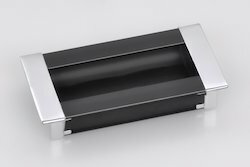 These handles are designed by our very accomplished professionals from the finest grade essential material, at standard with the business sector common standards. Our offered council handle is profoundly recognized among our customers, for their ideal completion and remarkable configuration. We give whole range in modified choices according to the necessities of our customers and at reasonable costs. Looking for Concealed Handle ?